(THIS POST PROBABLY CONTAINS AFFILIATE LINKS. OUR FULL DISCLOSURE POLICY IS REALLY BORING, BUT YOU CAN FIND IT HERE. Having a baby seriously derails your life. In the best way possible of course, but for a while afterwards, the simple things that you used to do just seem hard. Doing some simple preparation before the baby comes will help ALOT. There are probably some women out there who, 8 weeks postpartum, are on top of the world. They’re back at work. Their houses are spotless. They are wearing (clean) clothes. Maybe they have slept in the past week or two. I am not these women. Don’t get me wrong. I am savoring this season of my life. Perhaps I’m not relaxed, but I am thrilled to bits with my baby and I know that his itty-bitty-ness will expire. I choose to live on purpose – so I need to make him my priority and make all the memories I can with my limited, exhausted brain power. I had fair warning that this season of life would be a little overwhelming. 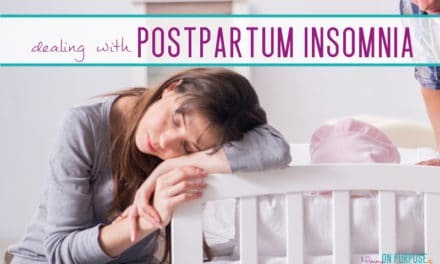 I listened when experienced mothers told me about the sleepless weeks, the crazy hormones and the general utter madness that is your first few months as “mom”. So I took some steps to make sure I wouldn’t have to worry about most of my regular “duties”… I implemented these 5 organizational systems to keep my life running as smoothly as possible whether you’re preparing for your first baby or your fourth. I have to admit, that organizational system number one is not something I came up with originally… the credit card company, phone company, gas company AND the Canada Revenue Agency all called me in November to say – “Why don’t you send us money anymore?”. Seriously. In my last few months of being pregnant I really dropped all the balls and I (who NEVER pays a cent of interest) literally just quit paying all the bills. I didn’t even realize time was passing and bills were due. I saw the envelopes, but it didn’t occur to me to open them. Save yourself this headache. Please. 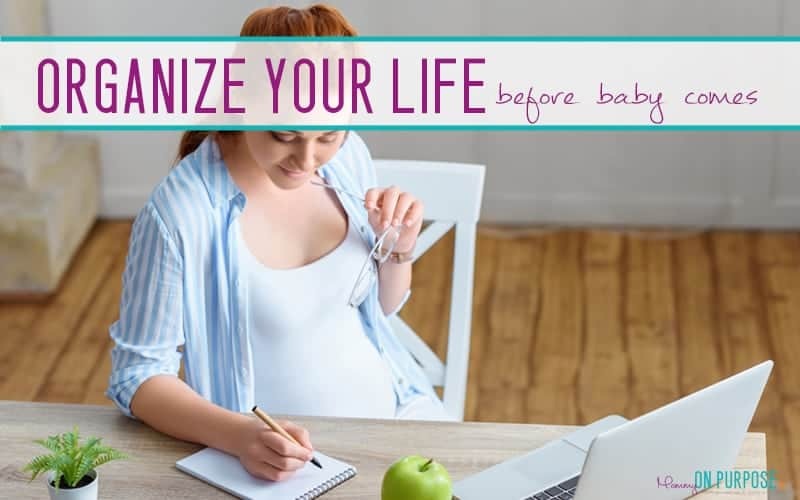 If you are preparing for a baby, you can use these organizational systems to get your life on autopilot (and shake a little of the responsibility). # 1 Set up automatic bill payments and use a budget app. To keep track of your spending and make sure you don’t have any scary surprise bills (which can happen in the excitement of, say, new baby shopping…) set up and be diligent about using a good budgeting app, like YNAB (You Need A Budget). Try YNAB for FREE here. # 2 Meal plan around freezer meals and pantry staples. My Wonder Women (gram, mom, sister) helped me make two months worth of freezer meals. These have been my lifeline. Every night G says “what’s for dinner?” and every night I look at him like he has two heads. Who has time to think about dinner?! Fortunately, I don’t have to THINK about dinner, because dinner is already made. I also purchased (a ridiculous amount of) the things that are so easy to make it’s almost a crime. (Stuff we wouldn’t normally eat…but the goal is auto-pilot right?) My pantry is full of minute rice, instant potatoes, and canned soup. # 3 Have a basic cleaning schedule. If you can get yourself onto a basic cleaning schedule you’ll have a pretty decent shot at keeping the house from growing weird mold. A basic schedule should include toilets, sinks, shower + bath, kitchen, vacuuming, garbage and laundry. You just need to keep it together, you don’t need to keep it pristine. I do toilets and sinks at the start of the week (like “sometime on Monday”), I give the kitchen a wipe down every night before bed, and laundry and vacuuming happens over the weekend. Find a routine that works for you and make it happen. # 4 Make a household supplies inventory. I made a list of all the household necessities we used on a regular basis. Then I set aside a corner of the attic and over the last couple shopping trips pre-baby I filled it with 2 months worth of toilet paper, paper towel, shampoo, body wash, laundry detergent, cleaning supplies, diapers etc. Stuff that you just don’t want to run out of. Hang on to the list (stick it in your planner) and keep track of when you’re running low on something. There’s no guarantee life will be back to normal in two months time, and don’t count on yourself to remember to check your stock pile before you DO venture to the store. # 5 Use a planner and write everything down. I’ve never been a planner girl. I’ve always kept track of things in my head. And I’ve done a good job of it. Until the “great bill payment fisaco of 2016” that is. I promptly bought a beautiful planner and now I am on top of stuff again. Every morning I can see exactly what needs to happen today, and every Sunday night I check back over my week to make sure all the things got done. But my bills are paid, my family is fed and my toilets are clean. If I don’t manage to put on real pants (or get out of bed before 11 am) at least I know I’m sort of keeping it together. You got it all together for all you need right now. The first, and only, time my husband asked, “What’s for dinner?”, I said, “I don’t know, what are you making?” He never asked again. We did have a discussion about there are TWO parents in this house and I just happen to be adjusting to a new job – Mommy. You need to adjust to your new job, too – Daddy. There is no reason Daddy cannot take a turn cleaning a toilet, re-heating the pre-made dinners, or anything else – it’s his home and baby, too. Yes, they work all day at their job. Women who work outside and inside the home seem to take care of most of the second job – cleaning, cooking, laundry, taking care of children and on and on. Why? It might not ever be 50/50, but a 70/30 or 60/40 would be a welcome change! To be honest, I took over all the laundry after he tried to do it once – disaster. His white briefs came out pink. I’m a bit naughty about the meal planning… 😉 However, I do have a daily planner as you suggested, and I love it! I have to write everything down or in the midst of 4 kids, homeschooling, volunteering, etc. – all hope would be lost. Great tips, thanks! I found an absolute lifesaver for me on household supplies and other staples like say COFFEE. Amazon has a service called Subscribe and Save. You schedule delivery of products you use constantly for monthly delivery. The more items the bigger the discount (5 items =15% discount). You set the frequency based on your needs like shampoo every 3months and coffee every month. You get an email reminding you to check your order a couple weeks before it comes to make any changes or skip anything you don’t need yet. It’s so fantastic to have just what you need show up when you need it. It also fits with your budget idea since it bills to a card and you can pay it with everything else. We have been using it for about 3 years, some months there are like 10 items showing up, I’m not sure how I lived without it. Amazon prime is great! I also just started using Walmart’s grocery pickup service. It’s really great! You download the app and add things to your list. When you’re ready, place your order and choose a pickup time. You will pay by credit card at this time. They will let you know when your order is ready. Drive over to Walmart, they have special parking for grocery pickup. You don’t have to get out of the car, they will load the groceries for you. There is no charge for this service!